Increasingly rapid technological changes are bringing about a metamorphosis in global trade. How can we guide these changes to ensure they improve the lives of Latin Americans? Increasingly complex and sophisticated global value chains are blurring the boundary between goods and services. New forms of leadership and new ways of connecting are emerging, and information is being updated every second, placing great pressure on our ability to make good decisions. Infinite possibilities are opening up for production, but new threats are looming for education, the world of work, and social inclusion. How can we build a form of governance that coordinates these efforts and builds a shared regional agenda that will take us toward a form of integration that is enhanced by innovation? 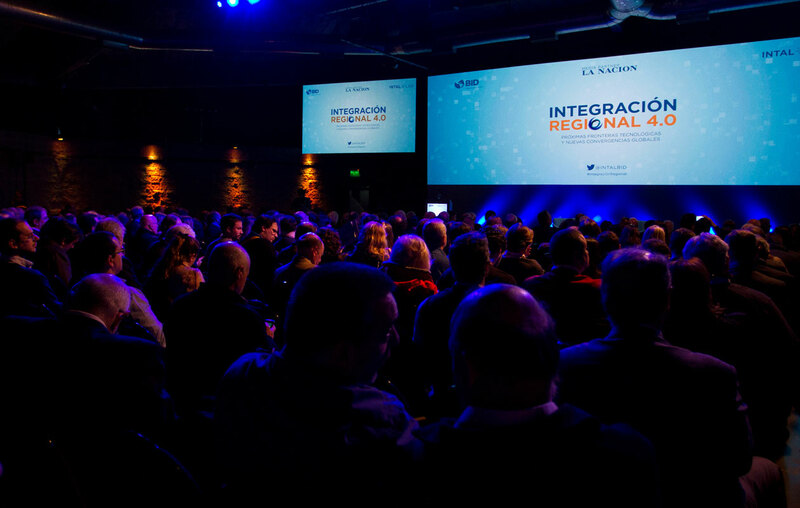 The Institute for the Integration of Latin America and the Caribbean (INTAL), part of the Integration and Trade Sector (INT) of the Inter-American Development Bank (IDB), held its annual flagship event on October 5, 2016, at the Auditorio Buenos Aires: Regional Integration 4.0: The Next Technological Frontiers and New Global Convergences. The event was covered by La Nación newspaper. The event was divided up into three panels, each of which was followed by brief presentations called INTAL Flashes, in which IDB experts introduced the community to the new instruments and tools that INTAL is offering. Some 790 people attended the conference and another 1,000 watched it live via streaming. All the presentations are available on the INTAL website (link in Spanish)..
During the event, IDB/INTAL held three workshops with players from both the public and private sectors. These focused on public–private partnerships for the transformation of production patterns, behavioral science and its impact on public policies, and digital transformations in business. Another workshop on participatory research on technology and work was held the day before the conference, October 4, at the University of Buenos Aires’s School of Economic Sciences. In his welcome message, IDB President Luis Alberto Moreno, stressed that the future of regional integration will imply a paradigm shift in how we approach international free trade agreements. This change is essential if Latin Americans are to live better, and should take into account both the conditions for global governance and scientific and technological advances. Mr. Moreno argued that innovation is what will allow the region to to make the leap forward in productivity and export diversification that it needs. Antoni Estevadeordal, manager of the IDB’s Integration and Trade Sector, who called upon the audience to reflect on the future of trade and regional integration in Latin America and the Caribbean while bearing in mind the effects of technological progress such as big data and the Internet of Things, which are shaping a new stage in the industrial revolution. He also underlined that new platforms for online buying and selling and e-commerce are breathing new life into the integration mechanisms between countries, together with the expansion of transnational global value chains, which are becoming increasingly complicated and sophisticated as companies constantly seek new markets, aiming to increase their productivity beyond national borders. During his opening speech, INTAL director Gustavo Beliz invited those present to rethink integration by looking at the components that have traditionally been associated with it—infrastructure, innovation, communication, and governance—from the fresh perspective of new technologies, with the aim of contributing to social inclusion and improving Latin Americans’ lives. He drew attention to the Latin American agricultural sector’s leap in productivity over the last 20 years, which enabled it to increase its share in the global agroindustrial complex to 12% in 2016 through the use of drones, nanotechnology, and precision agriculture. However, Mr. Beliz also said that there has been stagnation in the productivity curve since 2006, which shows that there is still much work to be done. He also discussed other examples of new technologies such as artificial meat and cattle cloning and how these might impact the MERCOSUR’s US$9 billion in beef exports. He also showed how new technologies are affecting other sectors, such as the automotive industry, with the manufacturing of self-driving cars and nonconventional fuels, which are ushering in the postpetroleum era. He also highlighted the importance of the development of physical infrastructure in Latin America and the resulting 400% increase in financing needs over the last 12 years. Mr. Beliz explained that for each day of delay in customs, exports of perishable goods can drop by up to 7%. In this regard, he pointed out that the region only invests 3.5% of its GDP in infrastructure, while developing countries spend almost double that share. He also discussed the region’s high levels of export concentration—just 43 products explain 75% of Latin American exports—and Latin Americans’ positive perceptions of economic integration (77% of people are in favor), based on the survey results provided by INTAL/Latinobarómetro, a new regional public good. However, he underlined that this integration needs to be of a high quality, something that the region’s citizens also perceive: 66% of them point to access to technology as the most positive aspect of integration. The first panel was chaired by Mario Sánchez, senior social protection economist at the IDB. The first speaker was Facundo Manes, a physician and the chancellor of Favaloro University, who stressed the importance of promoting the development of human capital as a country’s main form of wealth. Mr. Manes argued that human capital is only partly predefined by the gene pool and that the way this is expressed will depend on the interplay between biological factors and interaction with the environment. This is why human capital can be developed, strengthened, and built upon, but can also deteriorate or weaken, depending on how it is stimulated and the dynamics between people and their social contexts. Mr. Manes looked at some figures for Argentina, including the fact that 32.2% of the country’s population are living in poverty, a statistic which is made worse by the fact that most of these people are under the age of 14. With regard to education, he mentioned that a high percentage of elementary and secondary school students do not reach minimum learning levels. He also drew attention to some good news: the “demographic window of opportunity” that suggests that Argentina should strive to become a rich country by 2035, based on the fact that its population has more young, working-age people than elderly ones. Mr. Manes also stressed how important it is for public health policy interventions to take place on multiple levels: adequate nutrition, healthy surroundings, quality education, and social and emotional stimuli. The next speaker was Simon Ruda, director of internal affairs, security, and international development at the British Behavioural Insights Team. He discussed the application of behavioral science to public policy making, that is, how the analysis of human behavior can help design better policies. This method combines psychology, ethnography, behavioral economics, and public policy making. He described four such experiences relating to the following policy objectives: i) increasing tax revenues; ii) reducing unemployment by helping people seek work more effectively; iii) ensuring that the police force represents the population it serves by incorporating officers from minority groups; and iv) helping the police to deal with telephone calls by reducing the number of inappropriate requests they receive. Mr. Ruda presented some results of the application of behavioral science to public policy making, including a GPB330 million increase in revenue for the British Treasury in a single year and 5% less people needing social security benefits. Mariano Sigman, director of the Fundamentals of Applied Neuroscience Program at Torcuato Di Tella University and the Integrative Neuroscience Laboratory at the University of Buenos Aires, analyzed the decisions that define us as individuals, the way we take collective decisions, and the way we reach consensus. He spoke of the importance of achieving “symphonic integration,” an idea that Mr. Beliz also alluded to, and which Mr. Sigman used to discuss to the notion that each of us has information which is complementary and synergistic with the information that others have. He also discussed two situations in 2016 that involved collective decisions with major consequences for both the countries involved and for international integration processes: the Brexit vote for the United Kingdom to leave the EU and the referendum in Colombia on the peace agreements with the FARC. He also argued that cooperation is essential for us to be able to leverage this information. After getting the audience to take part in various experiments, he finished by dwelling on the importance of discussing our common problems, even in very polarized societies, so as to reach consensus. The first INTAL Flash looked at the voice of Latin Americans and was presented by Marta Lagos, the director of Latinobarómetro, who introduced some of the results of the 2016 survey on how Latin Americans perceive democracy and integration. Her copresenter was Marita Carballo, president of Voices!, who announced the partnership between INTAL and the World Values Survey and presented the global cultural map. The first presentation for the second panel came from Colin Maclay, director of the Digital Initiative at Harvard Business School and the Annenberg Innovation Lab at the University of Southern California, who discussed the progress of the Internet of Things (IoT). He argued that new technologies alone are not going to fix the world’s problems but they will be part of the solution. He added that they entail as many opportunities as they do risks. He underlined the importance of focusing first on the problem that needs to be solved and on what we want to achieve before thinking about developing a new technology. Mr. Maclay also stressed that the IoT captures and creates value, but the mechanisms that it uses to do so are not like those of the past. Instead, they are multifaceted markets, data platforms, and service providers. He said that these are changing the way business is done and that markets are currently in transition. He gave examples of this, including Netflix, which went from providing a physical service (DVD rental) to a digital one; Uber and Airbnb, which connect physical assets; and Waze and Big Belly, which generate data from what’s happening on the streets. In a similar fashion, the IoT allows us to increase transparency, obtain real-time data, and control the integrity of data throughout the supply chain, including for end-users. He finished by pointing to the importance of maintaining a positive outlook on the future, one that focuses first and foremost on thinking about what we want to achieve with new technologies, the need to create a digital data culture and establish clear policies around data access property rights, and on using technology in our favor. Facundo Alvaredo, CONICET researcher and codirector of the World Wealth and Income Database, the world’s largest income database, gave a presentation on how to build a megadatabase to measure and study income and wealth inequality. He pointed out that Latin America has yet to make a major investment in improving statistics and that the region’s governments need to make rapid progress toward providing such data. Mr. Alvaredo also argued that inequality is currently a major issue at the global level, yet there is a surprising lack of public policy initiatives to this end. As an example, he presented the share of the richest 10% of the population in the income distribution of various countries. While in France this group currently represents around one-third of the country’s total income and half of it in the United States, in South Africa the ratio is even more unequal as it is as high as two-thirds of the total. In Latin America, he said that some results are obtained from surveys but these do not capture part of countries’ incomes, which makes it difficult to interpret and present this data. The second panel finished with a conversation between Andrés Freire, minister of modernization, innovation, and technology for the City of Buenos Aires; Marcos Galperín, CEO and founder of MercadoLibre, the leading e-commerce platform in Latin America; and Walter Sosa Escudero, director of the undergraduate program in economics at the University of San Andrés; and was chaired by Gloria Vidal Illingworth, Ecuadorian ambassador to Argentina. Mr. Freire described some of the big data–related initiatives that are currently underway in the City of Buenos Aires, mainly in connection with tourism and developing tools for citizen engagement. Mr. Galperín went on to claim that big data is the basis on which artificial intelligence is built and that it democratizes access to an increasingly large volume of information. In connection to this, he said that MercadoLibre is working on algorithms for offering credit to SMEs that sell online. Mr. Sosa Escudero suggested that the challenge of big data is transforming huge quantities of unsystematized raw data into useful information that can improve people’s lives. During the second INTAL Flash, Alejandro Ramos Martínez, senior economist at INTAL, gave a preview of the IDB’s forthcoming 2016 Trade and Integration Monitor, which analyzes the current state of affairs of trade and integration in Latin America and the Caribbean. The report underlines how since mid-2014, global trade has been going through a contraction phase that led to the region’s exports dropping 15% in 2015 and 8.5% in 2016. As a consequence, the region is facing the challenge of export diversification in terms of both products and markets, incorporating higher levels of innovation in its production processes. The first speaker on the final panel was Charles Sabel, professor of law and social sciences at Columbia University. He argued that the task of governments is to open up markets but, at the same time, they need to have serious policies to drive the sectors of the future, which will be linked to knowledge and new technologies. Doing so will enable Latin American nations to make the transition from being middle- to high-income countries. He highlighted the importance of learning from past mistakes to prevent them from happening in the future and make the production process more robust, higher quality, and more efficient. He stressed the role of independent suppliers and drew attention to three characteristics that are shared by all the productive sectors: i) the shift from integrated production to global value chains; ii) global production instead of local production; and iii) short teaching and learning cycles. He also pointed out that the main problems of development and learning have to do with solving difficulties in coordination, which requires collaboration between the public and private sectors and among private firms. This should be a necessary condition for entering competitive markets and learning what leads to success. He finished his presentation by arguing that ensuring a brilliant future for the region depends on learning to do things right and also with making that learning available to everyone. The next presentation was from Martin Rhisiart, director of the Centre for Research in Futures and Innovation at the South Wales Business School and was based on studies that analyze the labor market in the United Kingdom. Among other factors, these studies predict that demographic changes in the United Kingdom will increase the working-age population by one-third over the next 15 years. In the same timeframe, the impact of new technologies will lead to 30% of jobs being automated. Mr. Rhisiart argued that these technologies have the potential to accentuate and accelerate the distance between those who are better placed to absorb new forms of growth and those who are not. He discussed some of the conclusions that these studies had reached on the impact that technological disruptions have on labor activities, which they affect very rapidly by creating new jobs and making others obsolete. New technologies and knowledge of these accentuate comparative labor advantages. He commented on trends toward the automation of knowledge and pointed out the transcendental role that governments will need to play in the years ahead as many jobs start to disappear, creating a need for policies that guarantee smooth transitions within labor markets. For example, while the demand for librarians and travel agents has dropped by nearly 45%, the need for programmers and big data experts has multiplied. The conversation that closed the third panel was chaired by Gabriel Casaburi, lead specialist at the IDB’s Competitiveness, Technology, and Innovation Division. The three speakers who took part werePeter Harris, chairman of the Productivity Commission of Australia; Fernando Isabella, director of planning at the Planning and Budget Office of Uruguay; Fernando Castro Trenti, Mexican ambassador to Argentina; José Antonio Viera-Gallo, Chilean ambassador to Argentina; Piero Ghezzi Solís, former minister of production of Peru. These experts shared their opinions on the future of the labor market and the challenge of organization and production in Latin America. They also discussed their experiences of how these challenges are being tackled in their countries of origin. The last INTAL Flash was presented by Alejandra Radl and Ignacio Estévez, trade and integration specialists at INTAL/IDB. They introduced the South American Infrastructure and Planning Council (COSIPLAN) Project Information System (SIP), a tool to support the planning and analysis of integration infrastructure in South America. This instrument is testing mechanisms to overcome one of the failings of public investment in the region as it aims to make Latin America’s physical integration initiatives more transparent. The tool shows how 90 integration works will be completed in the next five years and added to the list of 128 that are already complete, representing over US$28 billion. The closing panel was chaired by Félix Peña, director of the International Trade Institute at the ICBC Foundation, Argentina, and of the master’s program in international trade relations at the National University of Tres de Febrero (UNTREF). The other speakers included Lino Barañao, Argentina’s minister of science, technology, and productive innovation, and Lucio Castro, secretary of productive transformation at Argentina’s Ministry of Production. Mr. Barañao stressed that Argentina needs to offer innovative alternatives, sell its skills, and move toward knowledge-based integration. He argued that what determines a nation’s wealth has shifted toward the sustainable use of the environment and knowledge. He called upon the audience to think about how Latin American countries fit into this context and how they could come together as a supranational body. Mr. Barañao also underlined the fact that Argentina has excellent researchers in key areas of the technological revolution that we are experiencing. Its productive transformation is taking place on the basis of three multiuse technologies which basic research is a major component of: biotechnology, information and communication technology, and nanotechnology. However, he said that there are few technology-based companies with the capacity to absorb inventions and ideas. Argentina thus needs to increase domestic and foreign investment in research and development. Mr. Barañao stress that Argentina offers very attractive opportunities in relation to biotechnology, an area in which he believes the country could emerge as a global leader. Finally, he suggested that shared regional networks could be established to enable Latin American researchers to connect with one another. The newly created Latin American Center for Interdisciplinary Training (CELFI) is one example of this. Mr. Castro then described the international backdrop against which Argentina’s process of productive transformation is unfolding, notably the entry of nearly 800 million people into the global labor market, particularly in Asian countries, and a phenomenal technological shift that tends to be referred to as the fourth industrial revolution. He highlighted the importance of providing Argentines with the skills they need to take on a world that is being swept by technological change. Mr. Castro said that half of the companies in Argentina cannot find skilled technicians and operators, which demonstrates the country’s shortcomings in matters of education and how they affect the demands of the labor market. As a consequence, Argentina’s economic cabinet is carrying out a national production plan that aims to generate high-quality jobs that will improve the country’s competitiveness. The conclusions reached during this inspiring day included the need for a new form of governance that that will coordinate efforts and construct a regional agenda; rethinking the concept of integration in a world where new technologies that are already changing people’s lives are being adopted increasingly quickly; developing mental capital as the region’s main source of wealth; working collectively and seeking consensus; and generating a culture of innovation and entrepreneurship that will help the region diversify its exports, increase productivity, and create sustainable jobs, thus guaranteeing social inclusion.